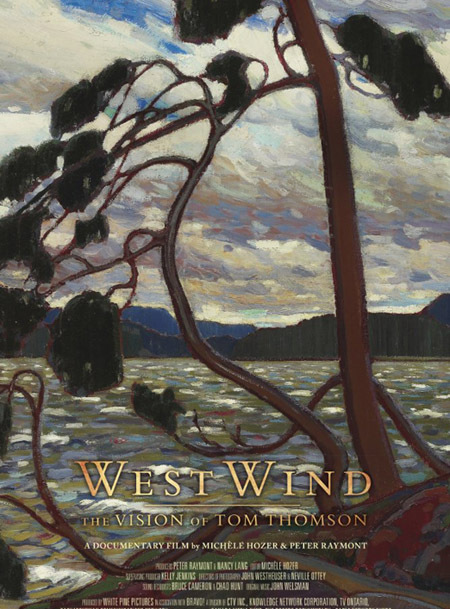 Opening the cottage around May 24 in the northern lakes and forests. 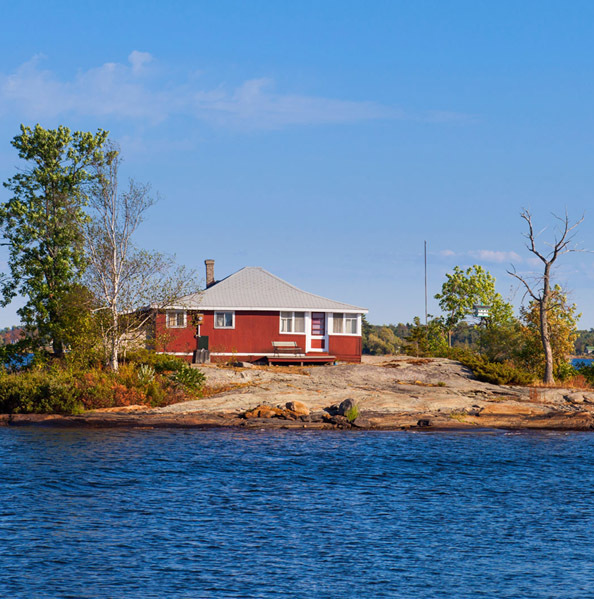 The holiday is nowadays defined as “the last Monday preceding May 25.” And this entrenches its status as part of the present-day Canadian people’s first long weekend of the summer season. 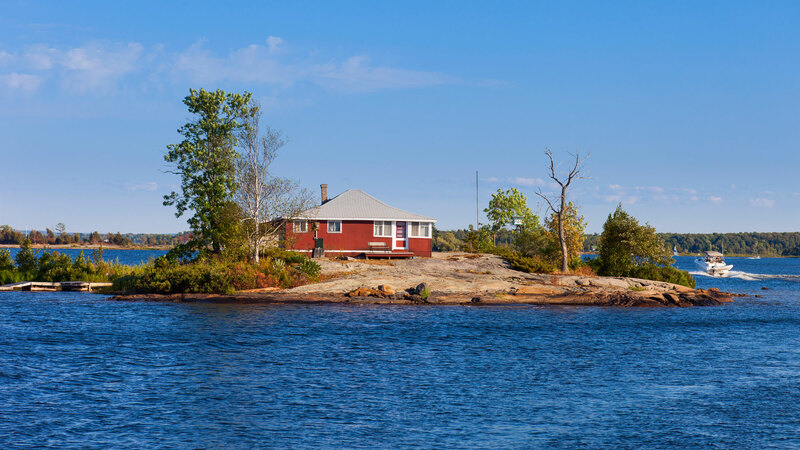 It is nicely timed for opening cottages at the lake, getting serious about gardening in your yard, or just lounging around your urban apartment (condo), mentally preparing for the brief burst of treasured hot weather in June (if we’re lucky), July, and August. Historically, the holiday was first celebrated in 1845 in the old United Province of Canada (ie modern Ontario and Quebec, somewhat organized as one province in partial response to the Lower and Upper Canadian rebellions of 1837–38). 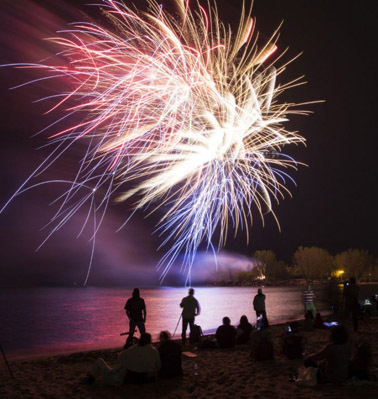 Fireworks on Victoria Day (also traditionally known as Firecracker Day) at Ashbridges Bay in east end of old City of Toronto. Melissa Renwick/Toronto Star. Then and for many years after Victoria Day was celebrated on the actual day of May 24 — which was in fact the actual birthday of Queen Victoria, Queen of the United Kingdom, 1837–1901, Empress of India, 1876–1901, and first head of state of the Canadian confederation that will be 150 years old this coming July 1, 2017. In the Toronto of the early 21st century the Victoria Day weekend has also acquired some sparse notoriety as a time when “Canadian republicans” who want to see the end of the British monarchy in Canada (and are nothing at all like “American Republicans”) come out to advance their argument on a (hopefully) sunny holiday afternoon. Patriotic Canadian girls in Ottawa on Canada Day. Do you really need a British monarch when you have this? Personally, I am a great believer in “Canadianizing and democratizing” the role of head of state in Canada’s modern parliamentary democracy. I also believe that both Brexit in the UK and Trumpism in the USA are, among other things, potent protests against the decline of the old White Anglo Saxon Protestant hegemony in Australia, Canada, New Zealand, the United States, and even the United Kingdom itself. 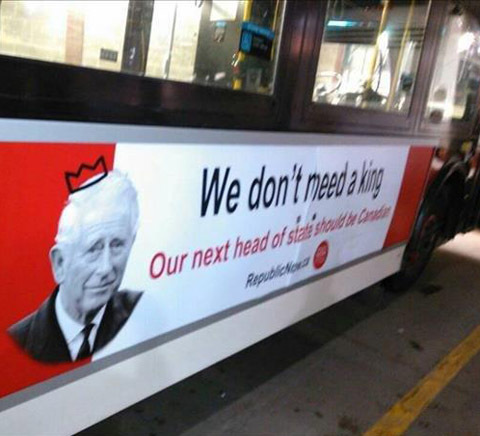 In Canada, as elsewhere, continuing support for the British monarch as head of state is another way of expressing a similar protest against the local decline of the old WASP hegemony. And, all qualms about “populism” aside, in the early 21st century this support remains surprisingly strong among many of the country’s aspiring anglophone elite cultures. It isn’t just “low-information” Canadians who like Donald Trump — or even the late Toronto Mayor Rob Ford — who remain staunchly (and almost pathologically?) opposed to long-overdue change. 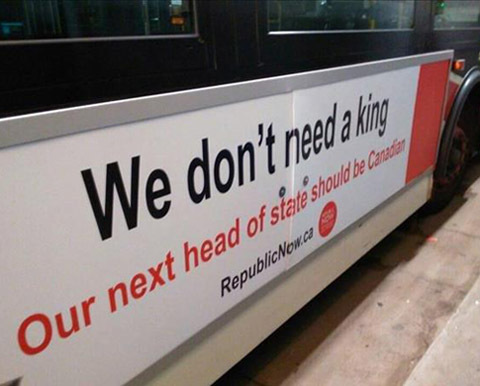 A Global News report on an Ipsos opinion poll about the monarchy in Canada — released just after this past Christmas 2016 — casts some quick bright light on the present state of the issue. Conservative leader Stephen Harper tried to boost support for the British monarchy in Canada while he was prime minister — especially after he finally managed to win a majority (of seats in parliament) government in 2011 (with less than 40% of the cross-country popular vote!). Sensing that some of her readers (and certainly her employers at “Global” — a term that used to be rendered as “Empire” in these parts) might find even these numbers unsettling, Monique Scotti also takes care to underline some immediate practical implications here. Even with all the political cynicism they acquired over Conservative Party of Canada founder Stephen Harper’s (surprisingly successful?) 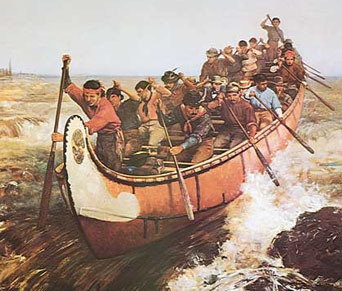 efforts to boost support for the British monarchy in the true north, strong and free, 2006–2015 (and especially after his majority government in 2011), Canadian republicans will tell you that all this is ultimately wishful thinking.
. Canot de maître shooting the Rapids, Frances Anne Hopkins,1879. It was the multiracial and multicultural fur trade, not the British monarchy, that first took Canada from coast to coast to coast. It may be that we will not finally formally and of course politely wave goodbye to the British monarchy in Canada until 73% of respondents in all the other provinces as well as Quebec (or even a little more) have told opinion pollsters that is what they want to do. There is no doubt that we have few bold federal politicians on this front. Our leaders will have to be pushed across the finish line by their followers. It is a key article of the Canadian republican faith, however, that this is bound to happen. Stephen Harper has shown how the popular momentum the republican cause in Canada had been developing since the middle of the 1990s can be blunted and stalled by systematic federal government action — from restoring the name “Royal Canadian Navy” and celebrating Tory legends about the War of 1812, to putting up pictures of the Queen in government offices, as in days of yore, etc. 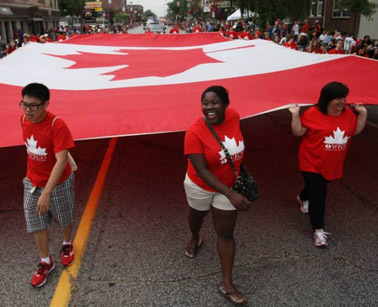 Canada Day parade in Windsor, Ontario — just across the river from Detroit, Michigan in the USA. 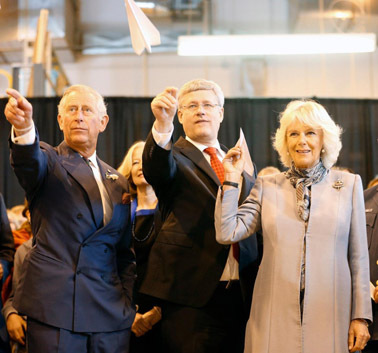 But both the clear defeat of Mr. Harper and his party in the 2015 election, and the current re-appearance of a country-wide Canadian majority for politely waving goodbye to the real King Charles III and his heirs and successors, show that, whatever else, at this moment in time there is certainly not a decisive (or even bare) majority of the Canadian people who want to follow Stephen Harper’s Canada to its bitter end. 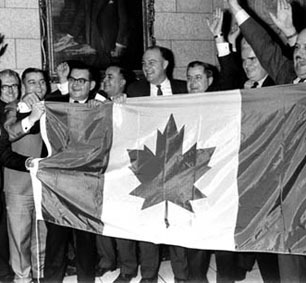 MP s celebrate approval of new independent Canadian flag by a 163 to 78 vote in the Canadian House of Commons, December 15, 1964. Yet demographically and in every other way as well, even in the English-speaking provinces Canada in 2017 is far from what it was when Elizabeth II became Queen in 1952. (See, eg, the independent Canadian flag of 1965 and the Constitution Act, 1982.) The last-ditch monarchist defence that “the challenges of re-opening the Constitution and making fundamental changes to our system of government remain prohibitive” is both weak-hearted and practically wrong. It could all happen at least quite a bit sooner than the various aspiring monarchist elites think … in the very end it is written on the wind. More joy in heaven for Heather Mallick’s change of heart on the British monarchy in Canada .. but ..